A celebration of art, the all-day restaurant within the Bankside Hotel has the same mid-century aesthetics as the hotel. Both have been designed by Dayna Lee of Los Angeles' Powerstrip Studio. The wrap-around Art Yard Bar & Kitchen is run by head chef Lee Streeton, previously of 45 Jermyn Street and Brown's Hotel. His British and European menu offers chargrilled cuttlefish, baked bone marrow with curry sauce and a cataplana of monkfish, shellfish, saffron and potato designed for two to share and cooked in the wood-fire oven. Sit up at the bar for drinks, snacks and small plates of anchovies and spicy lamb pide or choose from the full a la carte menu. Alternatively, opt for the 80-cover, open-plan main dining room - a bright space with Alexander Calder inspired mobiles, wood furniture with patterned tiling. 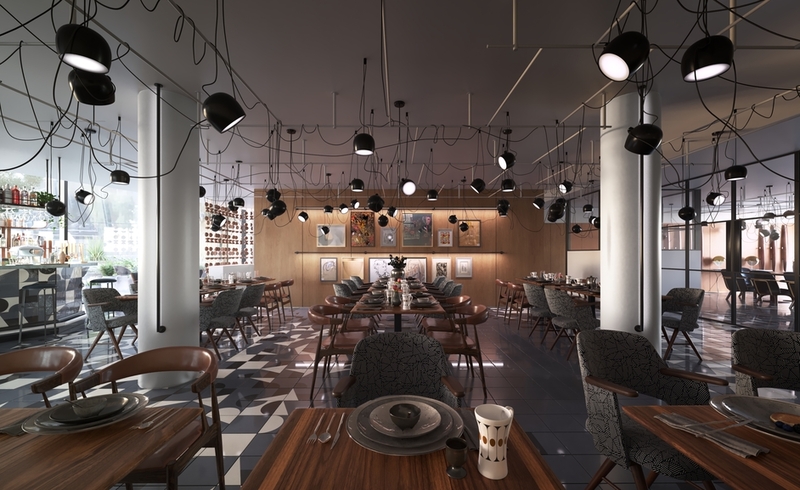 Specially commissioned artwork hangs across the main space and a mural from London ceramicist Laura Carlin decorates the 20-cover private dining room, with illustrations reflecting the culture of the Southbank. Art Yard Bar & Kitchen gyms, sporting activities, health & beauty and fitness. The best pubs near London Art Yard Bar & Kitchen. Art Yard Bar & Kitchen clubs, bars, cabaret nights, casinos and interesting nightlife. Where to have your meeting, conference, exhibition, private dining or training course near Art Yard Bar & Kitchen. From cheap budget hotels to luxury 5 star suites see our deals for Art Yard Bar & Kitchen hotels, including Sea Containers London from 0% off.